The Nikon D3 DSLR is the long awaited addition to the Nikon DSLR range – Nikon’s first full frame image sensor. The Nikon D3 features the new full frame ‘FX’ image sensor with an area of 36 x 23.9mm. It has a resolution of 12 megapixels. Existing Nikon lenses will work on the Nikon D3 in DX Crop mode (at reduced resolution of 5.1 megapixels). Maximum shooting speed is 9 frames per second (at full resolution) – although it can be boosted to 10 fps in DX Crop mode or even 11 fps with some adjustments and limitations to auto focus. The ISO range is a staggering 100 to 25,600 thanks to a new processor called Expeed. It has an ISO range of up to 6400. The D3 has a 3.0 inch LCD with Live View (920,000 pixels). The Nikon D3 will have a retail price of $4999.95. The feature list goes on and if you’re interested in learning more see Nikon’s announcement below. Eight Years After Changing Professional Photography Forever, Nikon Does It Again By Introducing The D3 Digital SLR. The D3 also features an entirely new 51-point auto focus system with Nikon’s 3D Focus Tracking feature and two new LiveView shooting modes that allow photographers to frame a photograph using the camera’s high-resolution LCD monitor. The D3 uses the world’s first Scene Recognition System to greatly enhance the accuracy of auto focus, auto exposure and auto white balance detection in the camera by recognizing the subject or scene being photographed and applying this information to the calculations for the three functions. Nikon’s digital SLR cameras based on its DX-format sensor have been hugely successful and represent an excellent combination of high image quality, size, and value. And while the DX-format has been widely accepted by professional photographers and photo enthusiasts around the world, there is an increasing demand among professionals for a digital SLR camera that features higher ISO sensitivity, wider dynamic range and offers the same relationship between picture angle and depth-of-field that were the hallmarks of the 35mm film format. Responding to this demand, Nikon has developed the D3 as its first digital SLR camera that features the Nikon FX-format CMOS sensor to meet the real-world requirements of its professional customers. The D3 delivers full resolution 12.1 megapixel images at up to nine frames per second when used with conventional AF-NIKKOR lenses. When used with DX NIKKOR lenses, the D3 automatically switches to the DX-format mode that uses a cropped portion of the sensor to generate 5.1 megapixel resolution images. While in this mode, the D3 automatically masks the portion of the viewfinder that will not be photographed and enables the capability to shoot up to 11 frames per second. Both Nikon FX and DX-formats provide their own advantages, and Nikon recognizes that both formats are necessary in order to satisfy its diverse customer demands. Based on this recognition, Nikon will strengthen its D-SLR lineup with the addition of the D3 FX-format SLR camera and a broadened assortment of NIKKOR interchangeable lenses, while continuing to develop and market high-performance DX-format cameras and lenses. The D3 introduces a range of innovative technologies and features that significantly improve the accuracy, control and performance professional photographers can get from their equipment. Nikon’s exclusive Scene Recognition System advances the use of Nikon’s acclaimed 1,005-segment sensor to recognize colors and light patterns that help the camera determine the subject and the type of scene being photographed, before an image is captured. This information is also used to improve the accuracy of auto focus, auto exposure and auto white balance detection functions in the D3. For example, the camera can track moving subjects better in all directions and by identifying them it can also automatically select focus points faster and with greater accuracy. It can also analyze scene highlights and more accurately determine exposure, as well as infer light sources to deliver more accurate white balance. The D3 incorporates Nikon’s new Multi-CAM 3500FX auto focus module that features an intelligent array of 15 cross-type sensors and 36 horizontal sensors. These sensors can either be used individually or in groups, with the option for Single Area AF mode and Dynamic AF modes using groups of either 9, 21 or all 51 focus points. The system also features 3D Focus Tracking with automatic focus point switching that takes advantage of all 51 AF points as it uses color and light information to accurately track the subject. Nikon’s new Scene Recognition System and improved focus algorithms also contribute to the impressive performance of the new 51-point AF system. Nikon’s new Picture Control System makes it easy for users of all experience levels to select and apply adjustments to how their pictures are rendered and create optimized settings to suit their individual preferences. The same settings produce consistent picture tone, even when using different camera bodies. The Picture Control System offers four basic setting options – Standard, Neutral, Vivid and Monochrome. These can be directly modified for easy adjustment and customization of image parameters, such as sharpening, tone compensation, brightness, and saturation. Photographers can customize and store up to nine customized options in the D3 and export up to 99 to a CF memory card, enabling photographers to share settings among multiple D3 cameras. Taking a cue from the popularity of Nikon’s D-Lighting technology, the D3 features a new Active D-Lighting mode that, when enabled, provides remarkable real-time highlight and shadow correction with optimized image contrast. Active D-Lighting produces broader tone reproduction in both shadows and highlights by controlling highlights and exposure compensation while applying localized tone control technology to achieve a more pleasing level of contrast across the entire image. And because the advantages of Active D-Lighting are applied as images are captured, image editing time can be shortened. The D3’s LiveView feature offers two modes for confirming subjects and composition on the new 920,000-dot, high-resolution 3-inch LCD monitor while shooting. The Tripod mode is designed for precise focus and accuracy when the camera is on a stable platform and the subject is not moving. In this mode, the camera focuses on the subject using focal-plane contrast and any point on the LCD screen can be selected as the focus point for the picture. The second mode, called Handheld mode, allows photographers to use the camera’s conventional TTL focusing system, with all 51-points and 15 cross-type points available. When using this mode, the camera activates focusing immediately when the shutter button is pressed, to ensure accurate focus. The D3 has the fastest reaction times of any camera in its class. Its shutter release time lag is only 37 milliseconds, and its start-up time is approximately 0.12 seconds. It is capable of continuously shooting approximately nine frames per second in full resolution with FX-format, up to 64 consecutive frames in JPEG, Normal compression. For NEF (RAW) files, the D3 can shoot up to 20 or up to 17 consecutive frames depending on whether it is set to 12-bit or 14-bit images. When using a DX-format lens, the camera automatically switches to DX-format mode, adjusting the resolution of the camera to 5.1 megapixels. In the DX-format mode, photographers also have the opportunity to increase the speed at which the camera can take pictures by limiting the auto exposure and going up to 10 frames per second or limiting both auto exposure and auto focus and going up to 11 frames per second. The D3 reflects Nikon’s most streamlined, functional and aesthetically pleasing layout in a digital SLR camera, all designed so photographers can take pictures with less fatigue, greater accuracy and comfort. The camera’s viewfinder provides virtually 100 percent coverage for accurate framing, while an ultra-high definition, 920,000-dot VGA LCD screen on the rear of the camera displays images with vivid color and clarity. The 170-degree wide viewing angle makes composing shots using the LCD screen in LiveView mode easy. The D3 also features a unique Virtual Horizon digital level sensor that indicates the camera’s alignment relative to the true horizon on the rear LCD screen or in the viewfinder. The D3 also features two CompactFlash™ card slots that can be used for consecutive recording (overflow), simultaneous recording (backup), separating recording of RAW and JPEG files or even copying pictures between the two cards. Images can be displayed directly from the camera to a high-definition monitor using the camera’s HDMI port and an optional cable. The D3 is designed for professional use in demanding conditions. The exterior of the D3 is crafted of magnesium alloy and the camera’s shutter mechanism is tested to 300,000-cycle releases. The 3.0-inch LCD is strengthened with tempered glass and the D3’s comprehensive array of rubber gaskets and seals protect vulnerable entry points from dust and moisture. 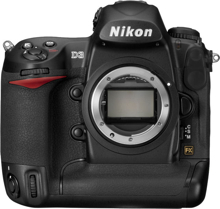 The D3 will be available from authorized Nikon Professional Dealers beginning in November 2007 for an estimated selling price of $4,999.95**. With the introduction of the D3, Nikon’s current lineup of digital SLR cameras now includes the new D3, D2XS, D300, D200, D80, D40X and D40. Luminous Landscape writes a first impression review of the Nikon D3 DSLR and writes – "Now the bottom line is – would I buy this camera? Actually, I pulled out my Amex card three times and asked Nikon to sell it to me, and three times they declined. To me it really was that good – but as I stated earlier, I am predisposed to like Nikons. If there is only one thing I would like Nikon to offer is more Megapixels, at least 17 preferably over 20. For my work it just gives more options in cropping to full page verticals." Ken Rockwell has reviewed the Nikon D3 and writes: My Nikon D3 lets me do things I’ve never xzbeen able to do, and makes it fast and easy. You don’t need a review: unlike any other camera I can recall, just talk to anyone who owns the D3 and you’ll hear praise gushing like no other camera. The Nikon D3 has no "buts," as in "I love it but…" Everyone just loves it. You’ll hear the same thing from any photographer who had his hands on one for just a few minutes. The more someone knows about serious shooting, the more they love the D3." This entry was posted in Nikon and tagged Nikon, Nikon D3 on March 3, 2008 by jonathanb.